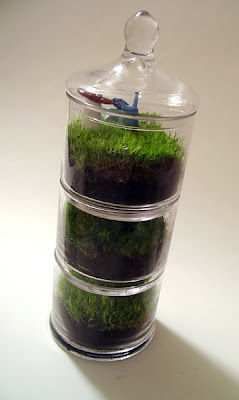 so looking at all kinds of cool stuff on etsy I became addicted to terrariums! 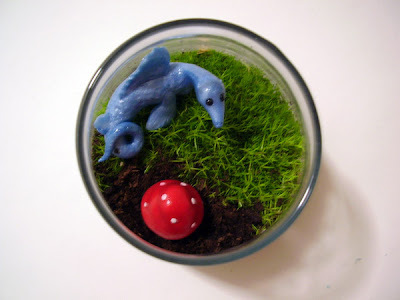 So this past weekend I took a soap/candle break and made my own terrariums. Found some scottish moss at the garden store, man is that stuff soft to touch. I went on a big search on etsy to find the just right items to go in them. 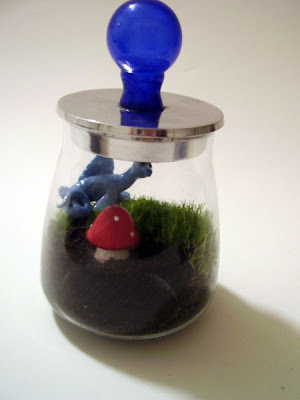 Found a bunch of great mushrooms from heylucy . 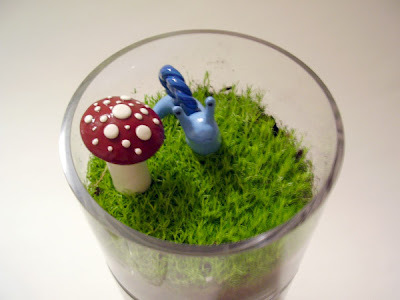 This little guy is going in the smaller one (blue top lid) I am putting on my desk at work and this snail, big mushroom and all the other little mushrooms are going in my big one for home. The scottish moss is great because it doesn't take much light or water and since I get pretty much no direct sun in my place that is just what I need. Sorry the pictures aren't the best the battery was going dead so I was rushing. 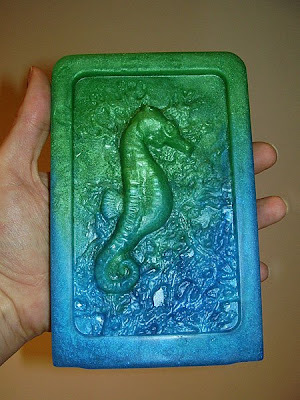 Well after suggestions in my Bramble Berry Loot post I tried out using the candle mold for a soap mold. I think it came out decent the bar is on the big side for sure but the detail is very nice. 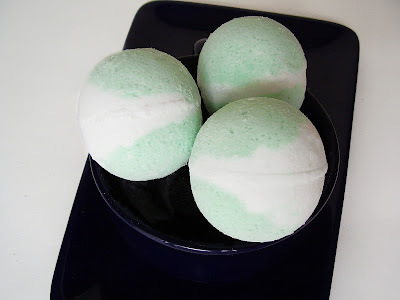 This one weighed in at 7.5 oz and is scented in Tranquil Tropics(Coconut Vanilla). I am including a picture holding it so you can get an idea of the size. Need to make 2 more then I will be sending them to my 2 nephews and my niece. Speaking of my nephew Jayden the last time I talked to him on the phone he told me to send him more scary soap (see pic) cause he was all out. Have to love 4 year olds right? So I am making some more fun soaps for the kids. 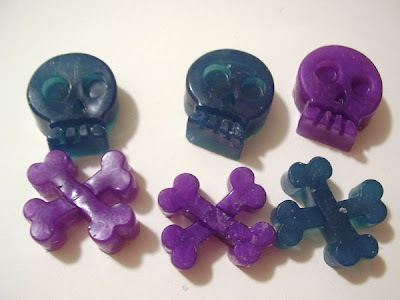 The skull soaps are scented in Banana Cream Pie. So the goodies I won in The Soap Queens comment give away arrived today! 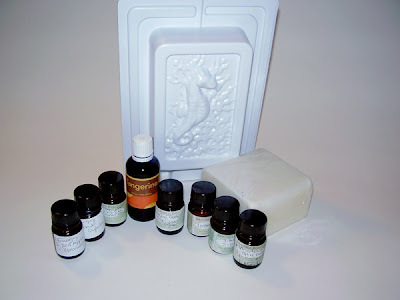 Some great stuff in the box My first ever Essential Oil and I have never used that type of candle mold. I already got some oh I want that for my bathroom when I showed that candle mold around at work so time to get testing it! I got all kinds of scent samples including a coconut one(I am a nut for coconut) and 1 lb of Melt & Pour soap to try out. 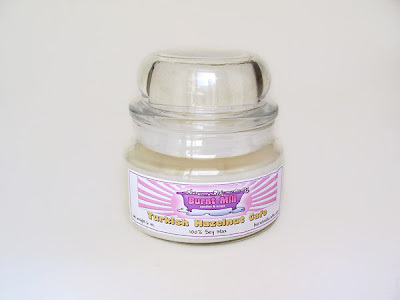 The Soap Queen is still doing the give away randomly so get on over to her blog and check out the posts and make some comments on things you like. Well I was running low on Blue Raspberry Icee so this weekend I decided to make a batch. 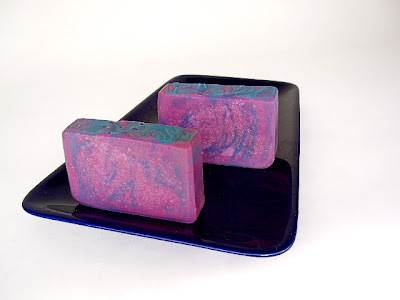 Well silly me decides to change the colors up my current batch is purple with a blue swirl. So this round I decided why not do blue with a purple swirl. 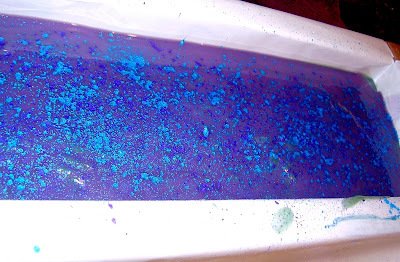 Well as soon as I added the blue to the main batch I remembered why I don't really do blue soaps. 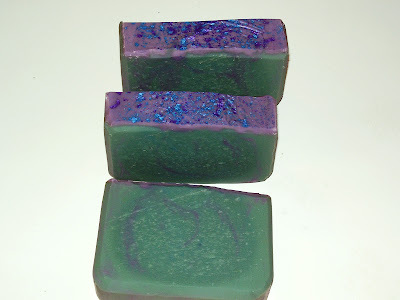 Blue soaps actually turn green because the color of the oils are pretty yellow. So much for the color plan on this batch right?!?!?! 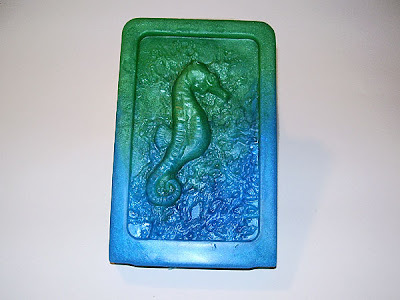 So I continue on with my purple swirl in the greenish soap then I pour it into the mold. With the top I end up doing a solid purple layer but it just isn't enough, so I end up putting some of the purple and blue mica on the top. 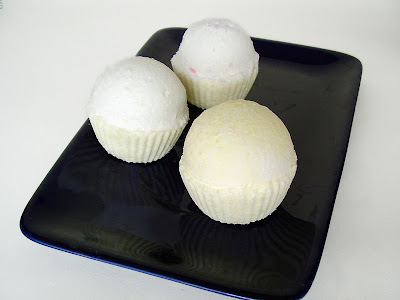 Earlier this week I mentioned I was working on bath bombs this week and that includes my attempt and cupcake type ones. So here is round 1! They need work jazzing them up but not a bad start. I didn't want to go the direction most others do trying to use frosting for the top. So now my challenge is to make them more exciting without frosting. Stay tuned for more rounds of these. I won a give away just by commenting! how cool is that I didn't even know they would do a give away! 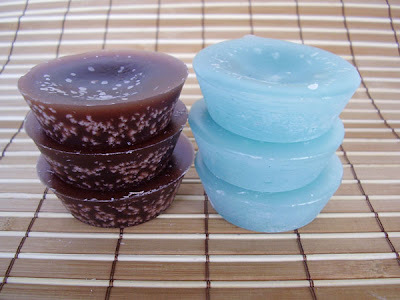 I won some candle/soap supplies which is great since I am now trying to start doing that kind of soap and I have very few supplies in that area anything would be great. 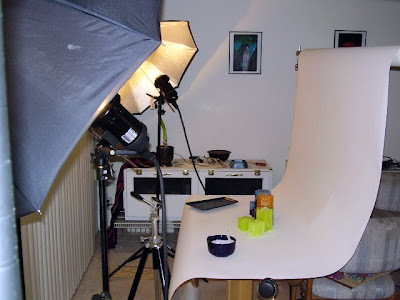 Stop by and check out The Soap Queen's Blog it rocks! 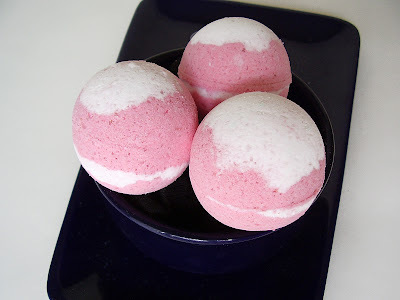 Well took a tiny break from making bath bombs so I could knock out all kinds of new soap scents. Now I am taking a break from soaping to continue working on other projects. I got some new rainbow mica colors in so I am starting to play around with those. 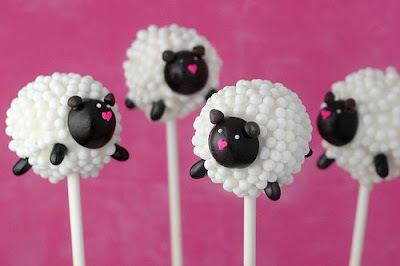 Can't wait to make some really far out color combos just have to figure out what scents to make first! 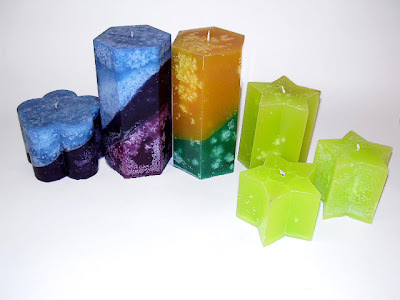 A few of the candles of the week. The freesia one is the beginning of an order for the client that lets me do what I want for colors, so I was trying out some crazy combos just to see what they look like.